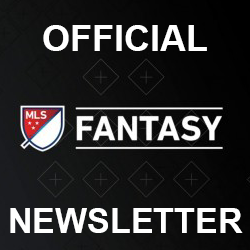 Fantasy MLS did some revamping this year. While the fancy looking new interface may attract attention, there are also some major rule changes afoot. In this piece, we take a deep dive into the new substitution rule, and its implication for the “switcheroo”, a technique many top managers have been using to extract that last bit of value out of their lineups. The relevant rule can be found in in Section 4 of the Game Rules, in the subsection titled “Reserve players and automatic substitutions”. But basically, it works like this: If any player in your starting XI does not play, the highest scoring eligible player from your bench is substituted in (as is allowed under the formation rules). If multiple players don’t play, that number of bench players is subbed in. So how can you use this to your advantage? Instead of having your XI being all starters, you can have one (or two) of them be instead players you are sure won’t play (i.e. a “scrub”) and put two (or three) starting caliber players on your bench. This means that the best of the two players on your bench will play, and if one of them bombed you are saved the horrendous 2pts for the match. The value of the switcheroo is significant: having two starters on your bench and a scrub on the field is worth an average of over 2.5 points per round over fielding 11 starters in your XI! (see footnote for all simulation details). This is a major departure from how the switcheroo operated in previous seasons. In years past, you would have two players on your bench (P1 and P2). After the P1 (but not P2) played, you would decide if you thought that P1’s score was higher or lower than the score you predicted that P2 would get. If you thought P2 would score more than P1 had scored, you would sub in P2. If not, you would let P2 auto-sub. Under the new rules, you don’t have to make any such decision, as whichever of P1 or P2 scores more points is automatically subbed in. Using a simulation, we can approximate how many more points the modern switcheroo is worth, as compared to an optimal execution of the switcheroo under the previous rules. Here we find that players employing a switcheroo under the new rules will yield, on average 0.7pts more per game than under the old rules. Although that may not sound like a lot, that 19pts over the season can make or break a first place finish. However, that increase of .7pts isn’t the biggest effect of the new substitution rule. The largest impact comes from the fact that, under the new rule, you can sub in more than one player, making the “double switcheroo” finally a reality. This creates an interesting dynamic, where, if you were going to engage in a single player switcheroo (i.e. one non-player (scrub) on the field, and two starters on the bench), it is a dominant choice to instead swap one of your field players with a scrub from the bench, resulting in 2 scrubs on the field, and three starters on the bench. To understand why this is the case, we need to think about the possible cases. Imagine we have 3 starting players, P1, P2, and P3. As of now, we have P1 and P2 on the bench in a switcheroo. Our question is, should we move P3 to the bench as well (and move an additional scrub onto the field)? To answer this question, let us look at the 6 possible score outcomes from the three players. However, in two of the outcomes (specifically when P3 is the lowest scoring player of the three), putting P3 on the bench in a “double switcheroo” prevents P3’s low score from counting, and increases the manager’s score for the round. Here we can see that, under the new rules, the “double switcheroo” is a dominant choice, doing just as well as the single switcheroo in some cases, and doing better in the remainder. We can again use simulation to estimate the value of the double switcheroo over the single switcheroo. Here we find that the “double switcheroo” yields a 1pt advantage over the single switcheroo and a 3.7pt advantage over no switcheroo at all. Finally, there is an additional strategy, which, instead of focusing on the substitution rule, exploits new transfer rule. Players can be transferred at any point before their team plays. This allows for a manager to employ something similar to the traditional switcheroo tactic, but with keepers. Imagine you have two keepers GK1 and GK2, both of whom you expect to start. Importantly, GK1’s game concludes before GK2’s game starts. For your initial line up, place GK1 on your bench, and GK2 in your starting lineup. After GK1 plays, you need to assess whether or not you expect GK2 to score more. On average, goalkeepers held by top managers score ~5.2pts. To maximize your expected score, if GK1 scores more than 5 points, you can transfer a scrub goalkeeper for GK2 in your XI. This will result in your high score from GK1 substituting in for the scrub goalkeeper at the end of the round. We can test the value of the keeperoo through simulation. Here we find that employing the keeperoo results in an average of 1.5pts over a traditional lineup. While this is a smaller total effect than the double switcheroo’s total effect, it is also significantly less costly. The cost of upgrading to the goalkeepers held by top players from a scrub is only $1.4m. This is compared to much higher $5.9m it takes to upgrade from a scrub forward to forwards held by top players. For this reason, especially when money is tight early in the season, prioritizing the keeperoo will be a wise move. So here we see that the switcheroo is now more valuable than ever. It is also easier to implement: no guessing whether your first player scored high enough or forgetting to make your substitution; it is all automatic (aside from the keeperoo). We also see that, if you choose to go for the modern switcheroo, it is always better to make it a double switcheroo. The keeperoo is a high value strategy relative to its low cost, and will likely be a must use to maximize points early in the season. It is important to note here that this isn’t an exhaustive list of all the now possible switcheroo strategies. Using a combination of the new substitution and transfer rules, you can technically field a team of up to 15 starters, making sure the bench players start in earlier games, and substitute in scrubs to field players in order to bring on the starters on the bench who score well. However, this strategy will be applicable to few managers, as fielding 15 starters is a cost prohibitive endeavour for most budgets. However, if unnecessary complexity is your game, hit me up on twitter @ethulin and we can hash it out. 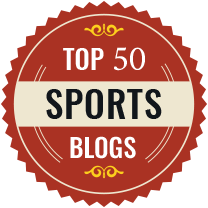 Thank you to @crolla and @mlsfantasystats for providing feedback on this article. I would also like to thank the now unfortunately defunct MLS Fantasy Viz for providing all the data used in the underlying simulations. Estimates were calculated via monte carlo simulation. 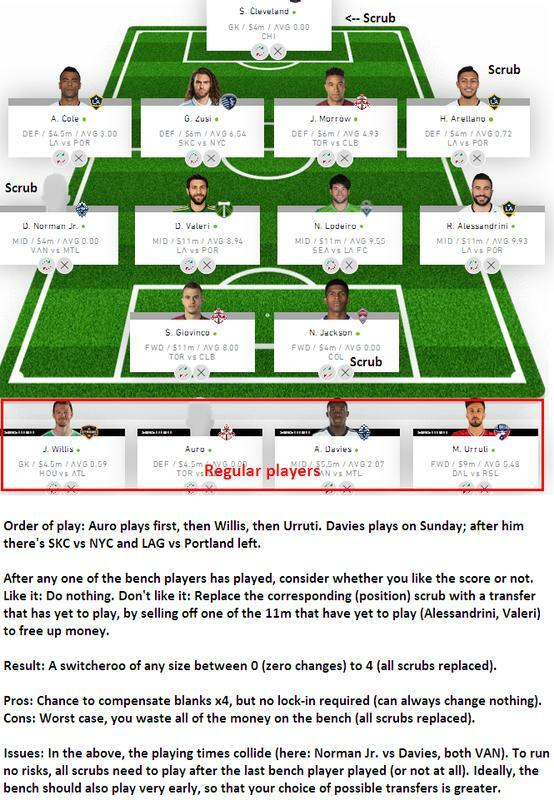 All data is drawn from forwards in the Fantasy MLS 2017 season who were worth at least 4.5m (to avoid scrubs) and listed as available. All forwards was chosen, despite not always being possible, to prevent the value of high variance strategies from being inflated by variance between player types. All simulation draws were weighted by the degree to which that player was owned by the top 1000 managers during that round. 10,000 runs were conducted for each simulation. To calculate the expected value of not using a switcheroo, the weighted average points scored was determined. To calculate the expected value of the modern switcheroo, match point scores were drawn from two players. The higher score was taken as the value of the incoming substitute for that switcheroo. The difference between the expected value of not using the switcheroo and the modern switcheroo was taken to be the marginal benefit of the switcheroo. To calculate the expected value of the traditional switcheroo, match point scores were drawn from two players. If the first player’s score exceeded the weighted average points, it was taken as the value of the incoming substitute. If the first player’s score was less than the weighted average points, the second player’s score was taken as the value of the incoming substitute. The difference between the expected value of the modern switcheroo and the traditional switcheroo was taken to be the marginal benefit of the modern switcheroo. To calculate the expected value of the modern double switcheroo, match point scores were drawn from three players. The value of the top two scoring players were taken as the expected value of the modern double switcheroo. To calculate the expected value of the modern single switcheroo (with one fielded player), the match point scores were drawn for three players. The first was taken as the field player. Then, the highest of the two remaining players was taken to be the value of the traditional switcheroo. The difference between the expected value of the modern double switcheroo and the modern single switcheroo was taken to be the marginal benefit of the double switcheroo. To calculate the expected value from the keeperoo, the match point scores were drawn from two goalkeepers. If the first goalkeeper’s score exceeded the weighted average score of goalkeepers, it was taken as the value of the incoming substitute. If the first goalkeeper’s score was less than the weighted average points, the second goalkeeper’s score was taken as the value of the fielded goalkeeper. The difference between the expected value of the keeperoo and the the weighted average points scored by goalkeepers was taken to be the marginal benefit of the keeperoo. Erik Thulin is a post doctoral research fellow at the University of Pennsylvania. His research has absolutely nothing to do with fantasy soccer. You can find him @ethulin on Twitter. >> complexity is your game, hit me up on twitter @ethulin and we can hash it out. All you have to do is to invert it. You *start* with the scrubs in the lineup and the starters on the bench, while leaving yourself enough wiggle room with late-playing expensive players you can sell off and replace and invest the money in upgrading a scrub. That way, the money stays on your bench only as a worst-case (replacing all scrubs in your lineup) — and as the entire point of a Switcheroo is taking a bet on inexpensive players, it’s also not going to cost all that much, anyway. I would assume a bench of some 4.5, 5, 5.5, perhaps 6. That’s only an addtional 3.0 or so (compared to the 4×4.0 you’d have to pay anyway). All of which is not to say everyone must do this, but I see no reason why anyone wouldn’t *start* that way — after all, if you change nothing afterwards, nothing is lost; but you do gain the option to do so. It’s an optional switcheroo at game-time, or added flexibility at zero cost. For anyone who’s into graphics, I made this one in the chat the other day. Thanks for sharing the idea! Really cool to see all the innovations coming out of this rule change. Before going into the example, some constraints here, not present in the standard version, is a really strict constraint on ordering. this means players you would like to be available in various roles won’t be. But let’s put that aside for now. So, let’s take your example in the image. Let’s say you end up a tough spot, Auro and Davis bust. Well, now we need to find enough money to at least upgrade a 4m defender and a 4m mid. That is tough. For defenders, an extra 1m spent on them is worth about 1.4pt. For mids, something like .9pts per mil. So if you go cheap, you are really really hurting your score. So lets say we downgrade our 11m forward. But we are loosing .8pts for every million we downgrade him by! So let’s say we do something vaguely optimal, and downgrade our forward to 7m, pick up a 6m defender and a 6m mid (as you get more points per $ for def than for mids). And we are super constrained in this selection, as there isn’t a ton of games left in the round. We are just taking a pretty huge bath here expected points-wise! Now, obviously I just picked the worst case scenario (first two players bust). But given how bottom of the barrel they are (a 4.5 D and a 5.5 M, when top players spend an average of 5.6m on D and 9.5 on M), that is not implausible. And in that case, we end up just burning money. I am therefore hesitate to hypothesize that it has a better return than the “modern double switcheroo”. I would love to model this out to see how it performs in the real world. Unfortunately, the decision rules are two fuzzy right now to do implement. However, if you are interested in working it out with me, hit me up on twitter and we can formalize it and test it out! If you just want a scrub who DEFINITELY won’t play, can you use a cheap player from a team on a bye? Will the game still allow you to transfer out that player for another one if you need to, or does it have to be a scrub from a team that is playing in that round?